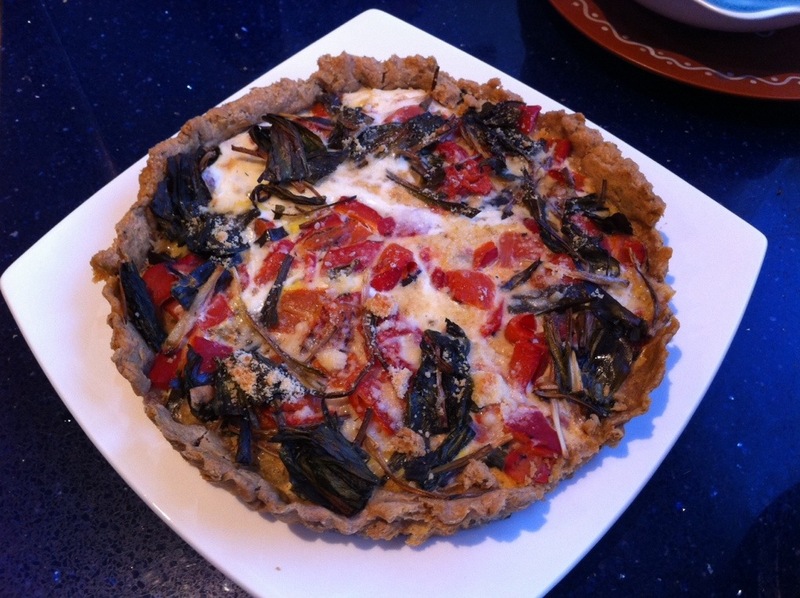 Ever since I made the Pizza Tart for Easter, I’ve been craving another savoury tart. So I thought I’d experiment with my original tart, and make a version that was a bit easier for a weeknight. It is finally spring here, which means it’s ramp season!!!!!! Ramps are one of my favourite (and alas, short lived) vegetables — also known as wild leeks, they are like baby leeks and taste oh-so-delicious. If you can’t find them, 2 red onions would make a lovely tart. Back in my gluten-eating days I first used ramps in a whole wheat + olive oil tart : my Spring Ramp & Nettle Green Tart, and it was one of my favourite combinations along with some Tomme cheese from Louise. 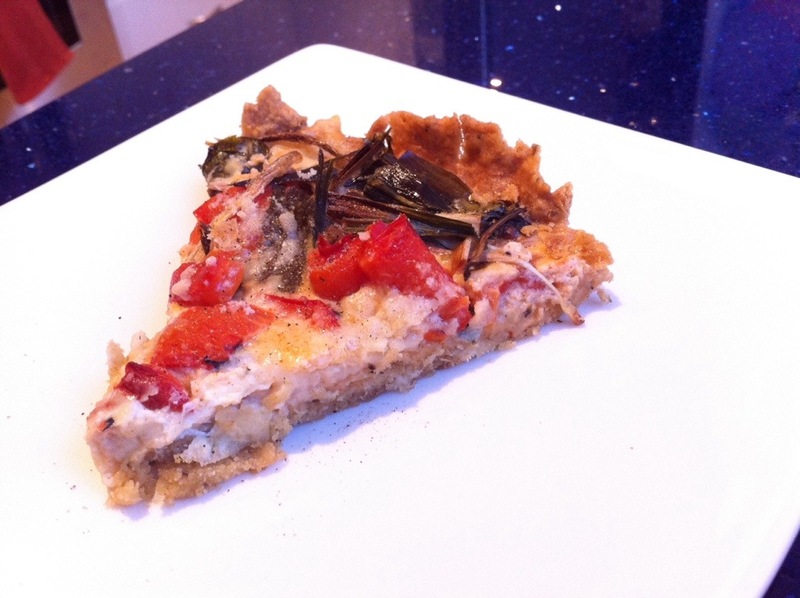 Well, I had wild leeks, and I had Tomme, so I thought it was time for a new tart. Somehow, I totally forgot I was going to use the Tomme, and used Gruyère cheese in this tart. It was divine, but the Tomme would have also been wonderful. Next time, Tomme. I made this version easier for a weeknight by making the dough in the afternoon and sticking it in the fridge to chill while I did other things. I did the same thing for roasting the ramps, and had a jar of roasted red peppers. So when it came to making the tart, I blind-baked the shell, popped in the prepared veggies, topped with the cheese and egg/milk mixture, and baked it for dinner. I wouldn’t say this is a “get home from work and have something easy for dinner” kind of meal, but there’s not that much prep work involved. A secret I have discovered with tarts: put a wrapping of aluminum foil around the outside of the tart pan. Sometimes the liquid egg/milk filling leaks out of the tart before it’s completely set, and a layer of foil keeps a mess from going all over the bottom of your oven, or a drip pan placed underneath the tart. Yup, savoury tarts. They’re a perfect way to showcase whatever veggies you bring home from the farmers’ market. So be prepared for lots of them around here. Begin by making the dough: In a food processor fitted with the dough blade, combine the flours (sorghum, chickpea, almond, and arrowroot) along with the salt, and blitz for 10 seconds to combine. Add the cold butter, and pulse until you get pea-sized balls. Sprinkle the iced water over the surface of the flour/butter mixture, and then blitz until you have a ball of dough. Form the dough into a single ball, and flatten into a disc. Wrap in plastic wrap, and refrigerate for 30 minutes. After the disc of dough has chilled for 30 minutes, place it on a gluten-free-flour-dusted countertop and roll out into a round bigger than your tart pan. Place the dough into a greased tart pan (with an outside layer of aluminum foil), and press into place. Cover with plastic wrap, and refrigerate for another 15 minutes. While the tart is chilling, prepare the roasted ramps: Spread out the ramps on a baking sheet lined with aluminum foil and toss with the olive oil. Roast at 375F for 20 minutes. Remove the chilled tart dough from the fridge and cover the bottom surface with a sheet of parchment paper. Top with dried beans or pie weights, to weigh down the bottom of the tart. Blind bake the tart at 375F for 20 minutes, then remove the weights and bake for another 15 minutes. Remove from the oven. 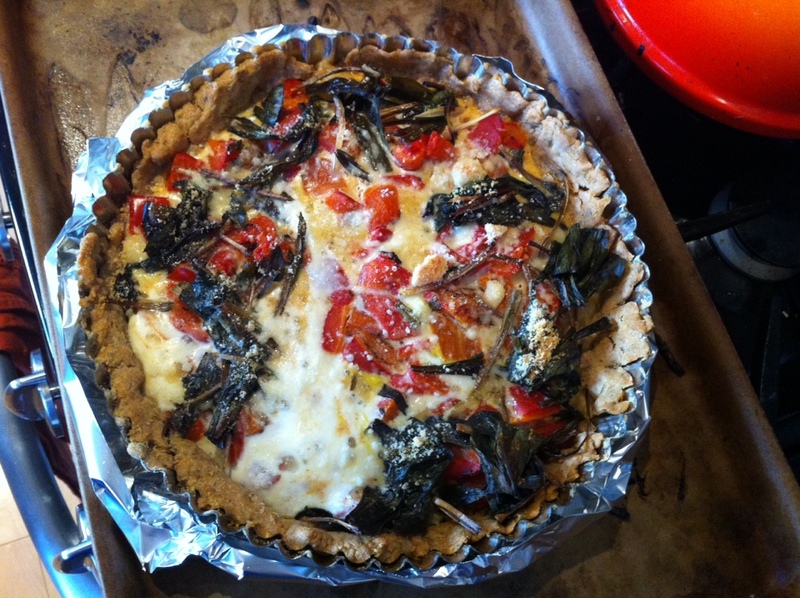 Fill the tart with your roasted ramps and red peppers, and sprinkle with the Gruyère cheese. In a small bowl, whisk together the eggs, sweet rice flour, and milk. Pour this eggy mixture over the veggies in the tart. Bake at 375F for 30 minutes, or until the eggs are set and a toothpick inserted into the centre comes out clean. Let cool for 10 minutes, carefully remove the outer ring of the tart pan, slice, and enjoy! This looks like a delicious vegetarian dinner! I’m a vegetarian too so I really love to see recipes like this! I’ve never heard of ramps before but they definitely seem like a good edition to this recipe!